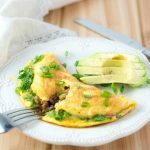 This easy and quick kale and sausage omelet is a great breakfast for the weekend or even during the week. It comes together pretty quickly. My husband made this today, and I loved it. It’s pretty healthy – he used kale, red bell pepper, green onions and mildly spicy grass-fed sausage we buy from a local farm. The sausage really packs so much flavor. This vegetable combination is pretty good but you can switch it up a little bit and add whatever you like or have on hand. I think I can eat omelet every day of the week! Tell me, what would you add to your omelet? We are always open to some new ideas! Brown sausage in a small skillet. When done, move to a plate. In a medium non-stick skillet, add 1 tsp coconut oil and heat over medium heat. In a small bowl whisk together the eggs, season with salt and freshly ground black pepper. Add the finely shredded cheddar cheese and stir. Pour the eggs carefully into the preheated pan. Cook until the edges have begun to set, about 2 – 3 minutes. Add the chopped red bell pepper, kale, green onions and sausage to one half of the omelet. Let it cook for another 1 – 2 minutes. Fold the other half over the veggies, and let it cook for 1 minute. Be careful not to overcook or burn your omelet. Run a small rubber spatula around the edges of the eggs so as to release it from the pan and then slide it onto a plate. Sprinkle with some chopped green onions and you can also serve it with sliced avocado. Enjoy! Easy and delicious kale and sausage omelet. Only 10 minutes to make. Perfect breakfast for a healthy start of the day. You will ask for more! In a small bowl whisk together the eggs, season with salt and freshly ground black pepper. Add the finely shredded cheddar cheese and stir. Pour the eggs carefully into the preheated pan. Cook until the edges have begun to set, about 2 - 3 minutes. Add the chopped red bell pepper, kale, green onions and sausage to one-half of the omelet. Let it cook for another 1 - 2 minutes. Fold the other half over the veggies, and let it cook for 1 minute. Be careful not to overcook or burn your omelet. I don’t think I’d change a thing. I can never get enough kale in my life and love it with sausage and eggs. Great recipe! I love making omelettes and frittatas…they’re always so delicious and have the best flavor combinations! This one is no exception, it looks beautiful and sounds amazing! I am lately kale fanatic. These eggs are perfect for me! 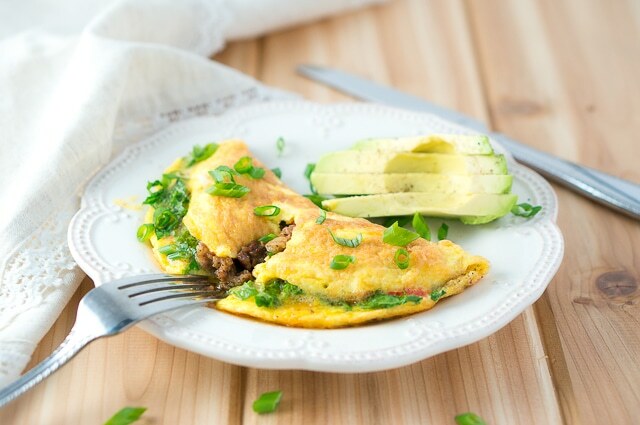 This omelet looks amazing, it’s totally making my tummy rumble right now! This looks like a great start to the day (although I’d love this for dinner, too)! 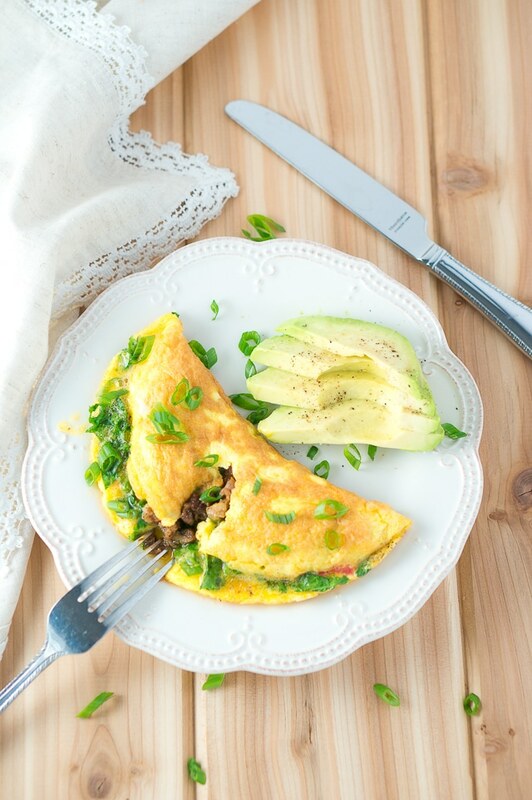 I love just about anything in my omelets, especially mushrooms! WOW!! I want this for breakfast — NOW!! Your omelet certainly looks fantastic. I am making this for breakfast this weekend. I love how healthy and delicious this looks! Will try it definitely! Pinned! Omelettes are great and I love the addition of kale. I often use spinach and eggs together, so kale is a perfect sub for it. That looks like a good, hearty breakfast, and what a great way to include greens into a morning meal. Talk about a perfect breakfast. Just gorgeous and happy setting ! So funny. I think of kale and sausage together all the time. But never at breakfast. This sounds so good. Must try. This looks so good, I don’t know why but kale and sausage just goes! 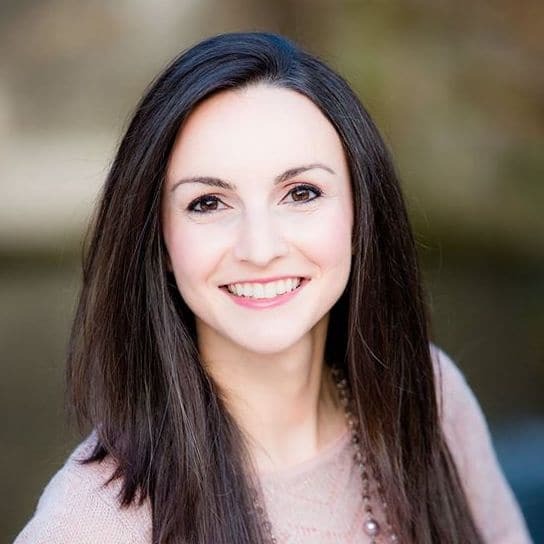 Pinning this recipe, thank you for sharing! Can this be prepped and frozen? I haven’t tried to freeze an omelet but in general, I don’t think cooked eggs freeze well.